We all have a recipe (or several) we go back to time & again, especially around the holidays. Perhaps we know the recipe so well imparting a comfort & confidence in making it. Or because a certain recipe gets requested by family & friends. 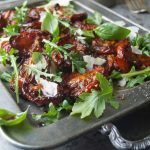 This sticky roasted tomato & arugula salad recipe is all those reasons & more why it’s on my favorite recipe list. 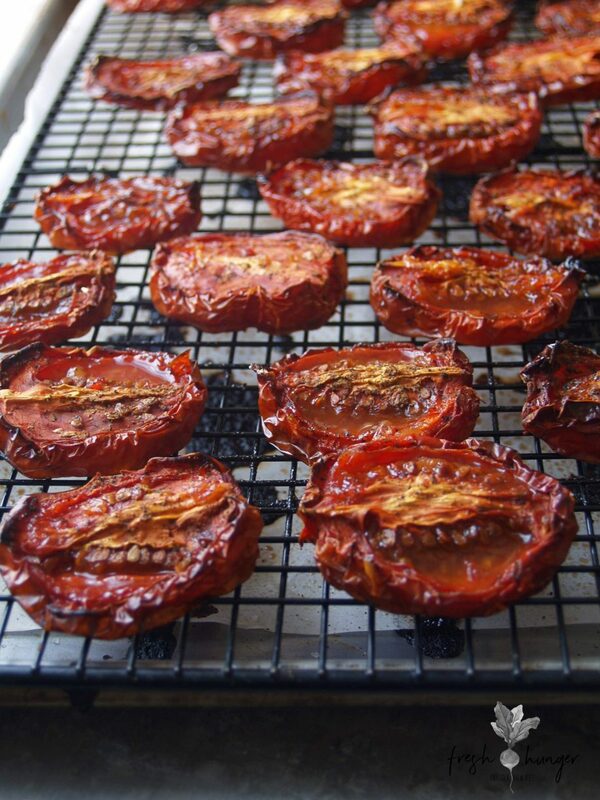 Firstly, if you’ve ever slowly roasted tomatoes in the oven after bathing them in sweet chili sauce or jam until their flavor became intense & their texture juicy & candy-like, you’d understand why this is one of my most requested recipes. Secondly, if you have a recipe that’s make-ahead, with a method that’s easy even the most novice cook & contains but a mere handful of ingredients, it’d probably be one of your favorites as well. The roasting part, although taking several hours, requires minimum effort from the cook. 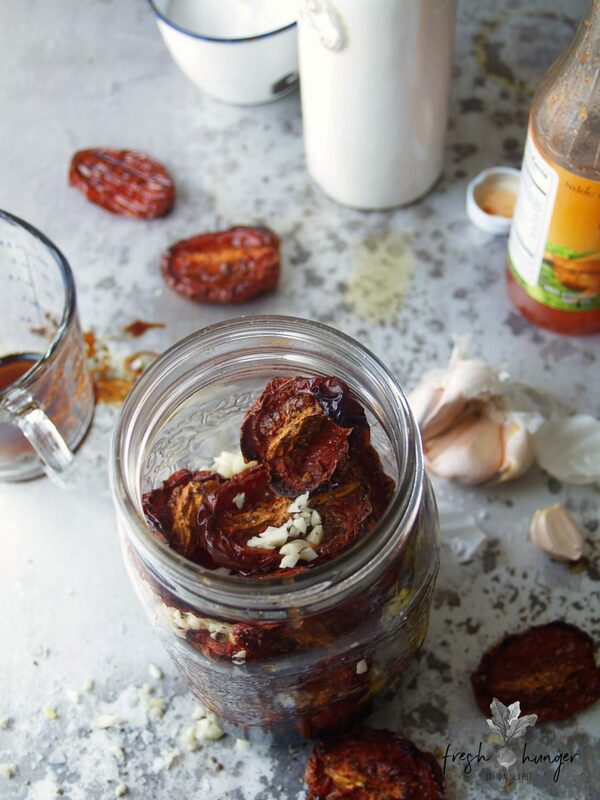 And once the tomatoes are roasted, shriveled & their flavors intensified, then pop them into a jar to marinated with some garlicy balsamic & olive oil. Ridiculously simple. Breathtakingly fabulous. You can make the tomatoes a week or so ahead of time. I confess I find that part hard – me with little to no self control & the tomatoes being so good, beckoning me to eat them. Still, if I hide them in the back of the fridge & try to forget about them, I’m usually okay although I have been known to cook a second batch just to replace the first batch I ate. Such is life. 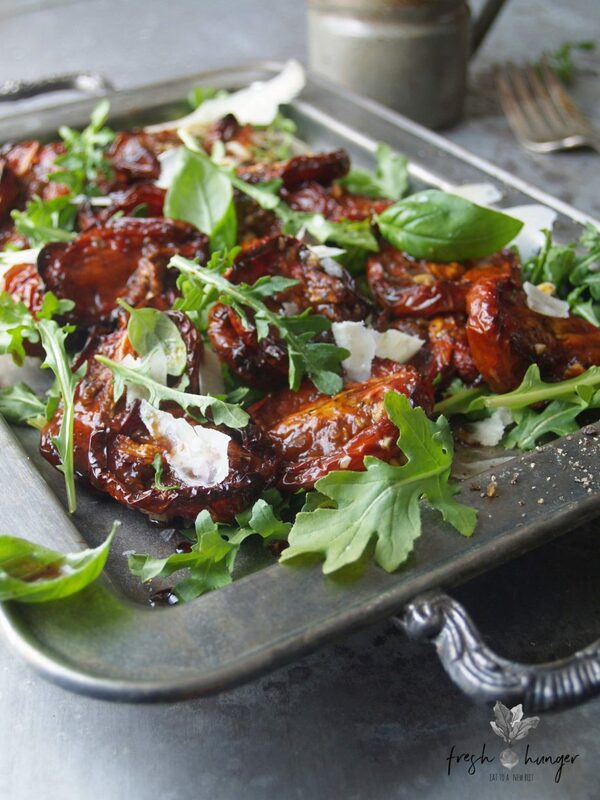 You don’t even have to create a salad with these sticky roasted tomatoes – they’re delicious served as is with a smattering of basil leaves for a bit of color, some shaved parmesan (so it looks like you’ve gone to some effort) & some crusty, sliced bread. If they do, by some miracle, survive untouched in the fridge, all you have to do is toss them with some baby arugula leaves, sprinkle on some shaved parmesan & drizzle over some of that garlicy balsamic marinade & you’ve got yourself quite a spectacular salad, appetizer or side dish. Perfect for the festive season. Preheat oven to 325°F (160°C). Line a baking sheet with parchment paper, place a greased wire rack on the parchment paper. Arrange the tomatoes, cut side up in a single layer on wire rack. Brush with 1/4 cup chili sauce; sprinkle with salt & pepper. Roast in preheated oven for 3 to 4 hours or until tomatoes are wrinkled & lightly browned around the edges & are starting to look dried. Combine oil, vinegar, garlic, remaining 2 tablespoons of chili sauce, pinch salt & pepper in a large jar with a screw-top lid. Add warm tomatoes to the mixture. Secure lid & gently turn jar to ensure tomatoes are coated in oil mixture. Chill for 8 hours, overnight or several days in advance. You can make these up to a week or so ahead. 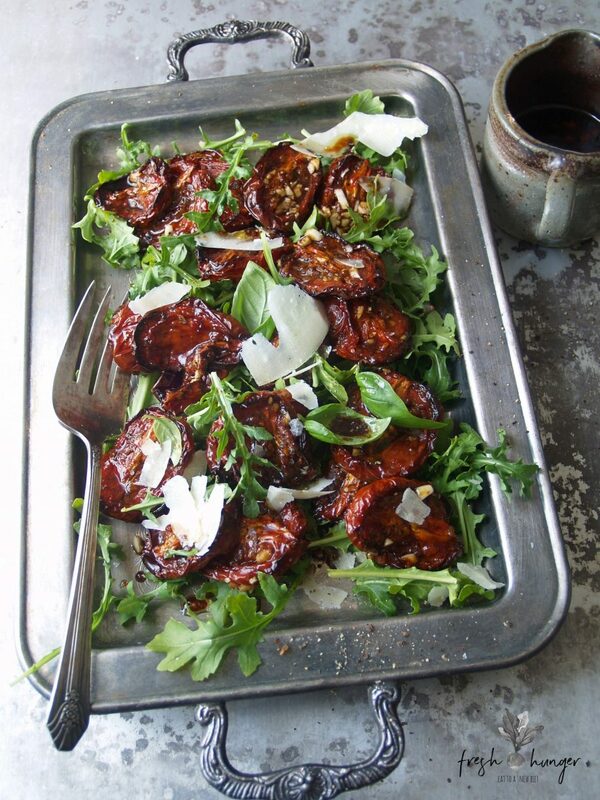 Toss tomatoes with arugula & arrange on a platter. 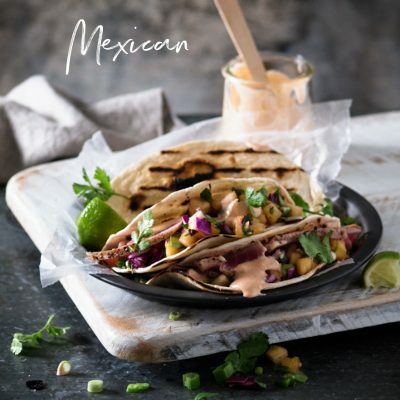 Drizzle with marinade. 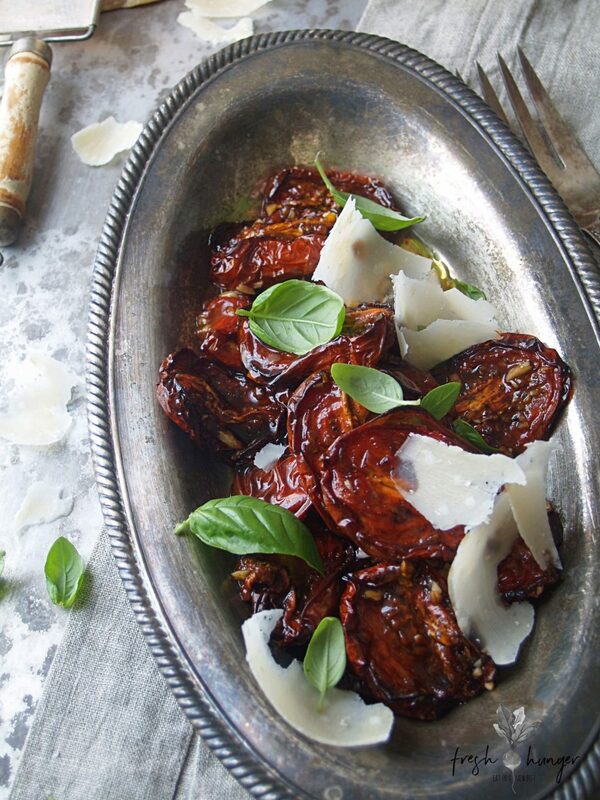 Sprinkle with parmesan shavings & fresh basil leaves.